The Healthy Hoff: What is Nutritional Yeast? 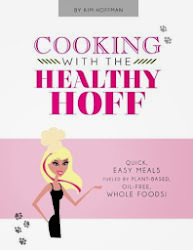 You've may have noticed that I reference Nutritional Yeast in a lot of my recipes: Hoff's Buttery Rice, Hoff's Chickzo, Hoff's Pesto Sauce - you get the picture. 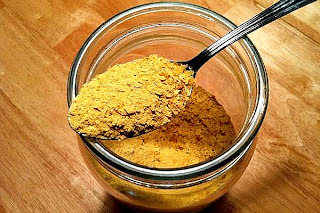 Nutritional Yeast is classified as a nutritional food supplement. It is derived from fermenting yeast, among other things. Depending on your taste buds or how you use it, it can take on a salty, nutty, cheesy or buttery flavor. Vegans tend to use it in place of cheese in recipes. It comes in flake or powder form and can be used as part of a recipe or as a condiment. Yes, Nutritional Yeast is usually fortified with B12 (make sure it is), making it an excellent source for this essential vitamin, which is lacking in a vegan/vegetarian diet. Nutritional Yeast is low in fat and sodium and free of dairy, sugar & gluten. Typically free of preservatives, it also contains protein, fiber and essential amino acids. Depending on the brand it may contain B vitamins, niacin, folic acid, zinc and selenium. But to be honest, I use it for the taste & the B12, everything else is just a bonus. Nutritional Yeast is a very popular item in the bulk bins of "healthy" grocery stores. It's a great bargain because it weighs next to nothing, so you can get a lot and pay very little - I stock up this way when the opportunity presents itself. It can also be found in the supplement section of health food stores. I typically get my Nutritional Yeast from Vitacost.com, because I don't have a "healthy" grocery store nearby. They sell Bob's Red Mill for $9 for an 8oz. bag. A little more than I suspect I would pay at the bulk bin, but this one is a convenience factor. Or you can get a handy dandy shaker by Red Star for $4 for an 5oz. bottle. I like them both. I use it as a flavor enhancer, particularly when I'm looking for a cheesy or buttery taste. You can use it as a topping/add-in for just about everything - pizza, scrambled tofu, garlic bread, stir-fry, spaghetti, casseroles, chili, soups, mashed potatoes, gravies, cheese sauce... Many times, vegan mac & cheese recipes will rely heavily on Nutritional Yeast. It also makes a great topping for popcorn - spray popcorn with a little Bragg Liquid Aminos and then mix in some Nutritional Yeast - cheesy popcorn! Store it in a cool, dry place (hmm, your cabinet perhaps). I like to store mine in a glass mason jar (along with ever other dry-good in my kitchen). At first you may think, "This tastes nothing like cheese!" Give it a fair chance, eventually your taste buds will come around and in the absence of real cheese, this stuff may become your new best friend.